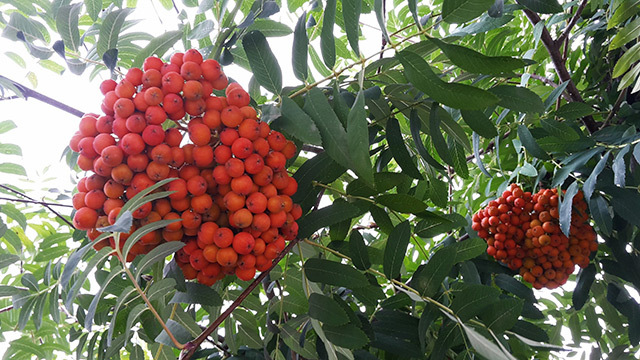 The rowan tree, which has the scientific name Sorbus aucuparia and which is sometimes called mountain ash, grows abundantly in the cool climates of the Northern hemisphere, which includes such places as the Balkans, Northern Europe, and Northern Asia. It can grow up to a height of 10 to 20 meters, but is sometimes still classified as a shrub. Rowan trees are beautiful, and can be used as aesthetic enhancers in gardens, parks, and roadsides. They are narrow and don’t take too much space, so it’s ideal to plant them along avenue edges. Rowan berries are soft and small, have a juicy consistency, and come in colors such as red, bright orange, pink, white, or yellow. They used to be incorporated heavily in English folklore and mythology, but are now extinct in England. They have also found their way in Scandinavia and Newfoundland back in the olden days. Rowan leaves have an average of 11 to 35 leaflets. The flowers have a creamy white color, are generally five to 10 millimeters in width, and have an average of five petals. Because of the presence of antioxidants in rowans such as quercetin and sorbic acid, they can help you fight free radicals, which are produced during cellular metabolism and sometimes incurred via external factors like exposure to smoke and pollution, and which attack healthy cells and may cause such cells to transform into cancerous cells. Antioxidants can help you fight the symptoms of aging and are good for protecting your eyes against age-related disorders like cataract and macular degeneration. They can also increase the power of cells to regenerate and heal. Rowan is also good for the skin. It rejuvenates and replenishes dead skin cells, keeping your skin glowing and radiant. Rowan has antibacterial, antimicrobial, and anti-inflammatory properties. Rowan is good for your immune system. It contains Vitamin C (ascorbic acid), which is a powerful antioxidant that induces the production of white blood cells, thus contributing to increased immunity son that your body can fend off common illnesses like colds, fever, and flu. Also, vitamin C stimulates the creation of collagen, which provides for muscle tissue strengthening, blood vessel buildup/repair, and skin elasticity. Since rowan is a good source of both soluble and insoluble fiber, it is good for your digestive system, and for maintaining healthy amounts of cholesterol in your body. It optimizes the function of your digestive system by helping with digestion of food and bowel movement. We’ve discussed that rowan helps maintain healthy amounts of cholesterol in the body. This function is good for your cardiovascular system as when cholesterol levels are low, there’s a good chance that your blood pressure is low too, thus lessening the risk of heart ailments. Rowan gives strength to the respiratory system. It has been known to relieve asthma, nasal congestion, and sore throats. Rowan berries are used as ingredients for jams, jelly, and sometimes alcoholic and non-alcoholic beverages. Raw rowan berries can give you a stomachache, as they contain parasorbic acid; however, once heated or cooked, the toxicity levels of rowan berries are eliminated. They are good for desserts like compote, which is a European dessert that is made of whole fruits in sugar syrup. They can also be used as bitter side meals to game dishes like lamb and deer. Their mildly minty and astringent taste fades with freezing. Rowan is good for your immune system and gives strength to the respiratory system. Rowan helps maintain healthy amounts of collagen in the body.